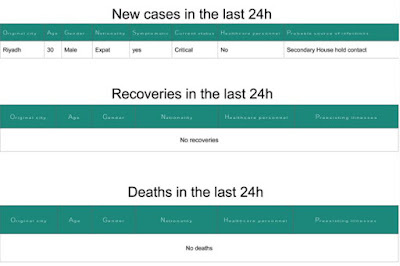 Although the numbers aren't large, for the 4th day running the Saudi MOH has announced a new MERS case, this time a 30 y.o. male in critical condition, listed as a secondary household contact of an earlier case. 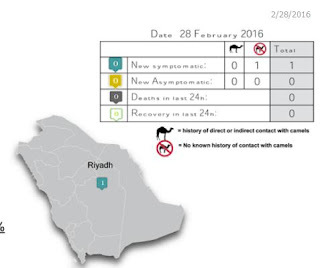 We've seen 3 other cases reported in Riyadh this month, with the most recent report from 11 days ago (see Saudi MOH Announces 2 Primary MERS Cases In Riyadh). Presumably this case is a contact of one of those. While stopping camel-to-human transmission is viewed as critical to controlling MERS, the vast majority of cases are infected through contact with other humans via household, nosocomial, or community transmission. Often, however, we never know the route of infection for primary cases - those not linked to health care facilities or households with other cases (see The Community Transmission Mystery).